Syntrophobotulus glycolicus Friedrich et al. 1996 is currently the only member of the genus Syntrophobotulus within the family Peptococcaceae. The species is of interest because of its isolated phylogenetic location in the genome-sequenced fraction of tree of life. When grown in pure culture with glyoxylate as carbon source the organism utilizes glyoxylate through fermentative oxidation, whereas, when grown in syntrophic co-culture with homoacetogenic or methanogenic bacteria, it is able to oxidize glycolate to carbon dioxide and hydrogen. No other organic or inorganic carbon source is utilized by S. glycolicus. The subdivision of the family Peptococcaceae into genera does not reflect the natural relationships, particularly regarding the genera most closely related to Syntrophobotulus. Both Desulfotomaculum and Pelotomaculum are paraphyletic assemblages, and the taxonomic classification is in significant conflict with the 16S rRNA data. S. glycolicus is already the ninth member of the family Peptococcaceae with a completely sequenced and publicly available genome. 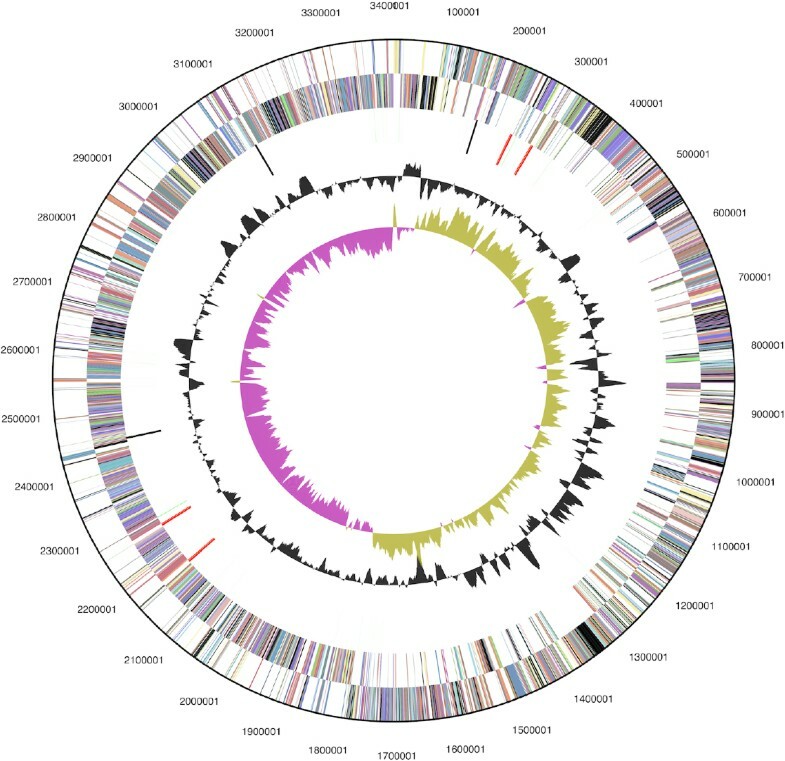 The 3,406,739 bp long genome with its 3,370 protein-coding and 69 RNA genes is a part of the Genomic Encyclopedia of Bacteria and Archaea project. Strain FlGlyRT (= DSM 8271) is the type strain of Syntrophobotulus glycolicus within the monotypic genus Syntrophobotulus , which is affiliated to the family Peptococcaceae within the order Clostridiales . The genus name is derived from the latinized Greek syntrophos meaning having grown up with one, and the Latin botulus, sausage, a syntrophic sausage-like item . The species epithet is derived from the Neo-Latin acidum glycolicum meaning ‘glycolic acid’, ‘referring to the key substrate of this species, glycolic acid . 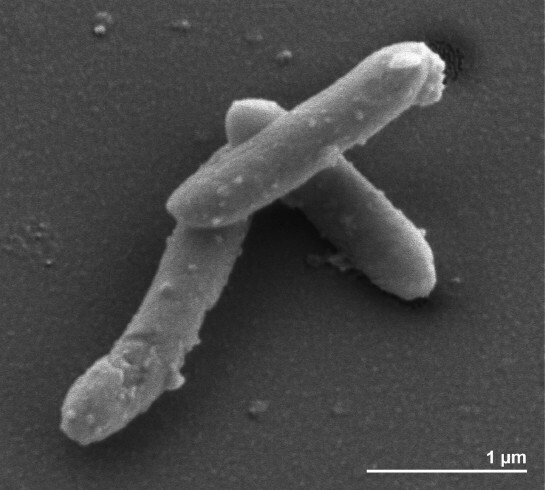 The major characteristic that differentiates this genus from other bacteria is the ability to oxidize glyoxylate under anaerobic conditions . The major source of glycolate in nature is excretion by algae and other photoautotrophs and chemoautotrophs [4–7]. Strain FlGlyRT was isolated from anoxic sewage sludge in Konstanz, Germany , but was also mentioned in earlier reports . No further isolates have been reported until now. Here we present a summary classification and a set of features for S. glycolicus FlGlyRT, together with the description of the complete genomic sequencing and annotation. A representative genomic 16S rRNA sequence of strain FlGlyRT was compared using NCBI BLAST  under default settings (e.g., considering only the high-scoring segment pairs (HSPs) from the best 250 hits) with the most recent release of the Greengenes database  and the relative frequencies of taxa and keywords (reduced to their stem ) were determined, weighted by BLAST scores. The most frequently occurring genera were Desulfitobacterium (45.4%), Desulfosporosinus (19.3%), Dehalobacter (18.0%), Heliobacterium (13.8%) and Syntrophobotulus (2.6%) (85 hits in total). Regarding the single hit to sequences from members of the species, the average identity within HSPs was 99.7%, whereas the average coverage by HSPs was 99.7%. Among all other species, the one yielding the highest score was Dehalobacter restrictus (Y10164), which corresponded to an identity of 95.0% and an HSP coverage of 85.2%. (Note that the Greengenes database uses the INSDC (= EMBL/NCBI/DDBJ) annotation, which is not an authoritative source for nomenclature or classification.) The highest-scoring environmental sequence was AJ278164 (‘Dehalobacter sp. clone SHD-11’ ), which showed an identity of 95.3% and an HSP coverage of 86.8%. The most frequently occurring keywords within the labels of environmental samples which yielded hits were ‘soil’ (6.5%), ‘microbi’ (6.4%), ‘respons’ (4.8%), ‘paddi, rice’ (4.6%) and ‘condit’ (4.5%) (165 hits in total). The most frequently occurring keyword within the labels of environmental samples which yielded hits of a higher score than the highest scoring species was ‘dehalobact’ (100.0%) (1 hit in total). The BLAST analysis results concur with earlier reports on the ecology and the physiology of the isolate whereby it was isolated from a co-culture with other sulfate-reducing bacteria [3,8]. 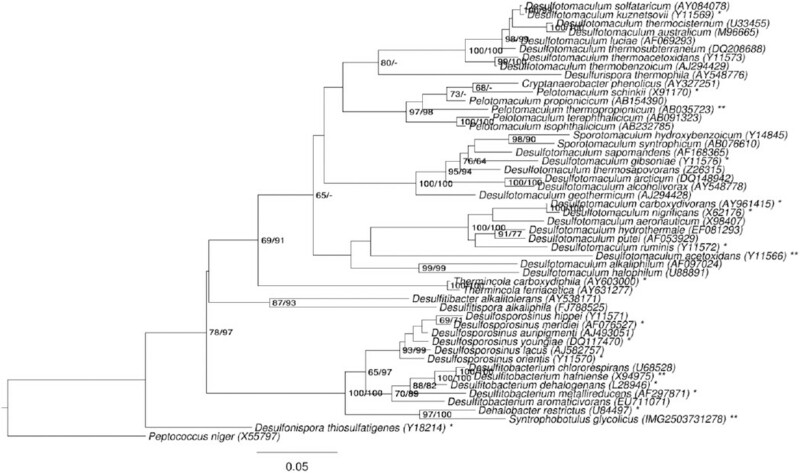 Figure 1 shows the phylogenetic neighborhood of S. glycolicus in a 16S rRNA based tree. The sequences of the four 16S rRNA gene copies in the genome differ from each other by up to eight nucleotides, and differ by up to 14 nucleotides from the previously published 16S rRNA sequence X99706, which contains two ambiguous base calls. Phylogenetic tree highlighting the position of S. glycolicus relative to the type strains of the most closely related genera within the family Peptococcaceae. The tree was inferred from 1,306 aligned characters [13,14] of the 16S rRNA gene sequence under the maximum likelihood (ML) criterion  and rooted with the type species of the family. The branches are scaled in terms of the expected number of substitutions per site. Numbers adjacent to the branches are support values from 700 ML bootstrap replicates  (left) and from 1,000 maximum parsimony bootstrap replicates  (right) if larger than 60%. Lineages with type strain genome sequencing projects registered in GOLD  are labeled with one asterisk, those also listed as ‘Complete and Published’ with two asterisks [19–21]. As two of the genera selected for Figure 1, Desulfotomaculum and Pelotomaculum, appeared as paraphyletic in the tree, we conducted both unconstrained heuristic searches for the best tree under the maximum likelihood (ML)  and maximum parsimony (MP) criterion  as well as searches constrained for the monophyly of all genera (for details of the data matrix see the figure caption). The best-known ML tree had a log likelihood of −12,054.61, whereas the best trees found under the constraint had a log likelihood of −12,209.39 and were significantly worse in the SH test as implemented in RAxML  (p < 0.01). The best-known MP trees had a score of 2,018 whereas the best trees found under the constraint had a score of 2,076 and were significantly worse in the KH test as implemented in PAUP*  (p < 0.0001). Accordingly, the current classification of the group is in significant conflict with the 16S rRNA data and apparently does not reflect its natural relationships. The classification could be improved if combinations of phenotypic character states were found which characterize a set of appropriately rearranged, then monophyletic genera. However, it might also be that the goal to ‘define’ each genus in terms of unique combinations of few, potentially arbitrarily selected character states is over-ambitious, if not misleading in this group of organisms. Apparently a taxonomic revision of the family appears to be necessary which focuses more strongly on the genealogy of the organisms than previous treatments. Cells of strain FlGlyRT are Gram-positive, spore forming and slightly curved rods of 2.5–3.5 by 0.5 µm in size  (Figure 2). Though the organism is reported to be non-motile, numerous genes associated with flagellar motility are present in the genome (see below). Growth occurs between 15°C and 37°C with an optimum at 28°C, and in a pH range of 6.7 to 8.3, with an optimum at pH 7.3  (Table 1). The reported habitat for this strain is sewage sludge and anoxic freshwater sediments . Initial isolation condition was from defined co-cultures of fermenting bacteria with homoacetogenic or methanogenic bacteria which converted glycolate completely to CO2 and H2, with concomitant reduction of CO2 to either acetate or methane [3,8]. Later strain FlGlyRT was identified as the primary fermenting partner in these co-cultures and glyoxylate was the substrate . Strain FlGlyRT grows optimally in freshwater medium although growth also occurred in brackish-water medium with 110 mM NaC1 and 5 mM MgCl . Strain FlGlyRT is strictly anaerobic, growing chemotrophically in pure culture by fermentative oxidation of glyoxylate . In pure culture, glyoxylic acid is fermented to carbon dioxide, hydrogen, and glycolic acid . However, in syntrophic co-culture with, e.g., Methanospirillum hungatei or Acetobacterium woodii as a partner, glycolic acid is converted to carbon dioxide and hydrogen . Glycolate oxidation to glyoxylate and vice versa is coupled to a membrane-bound electron transport system that catalyzes either a proton potential-driven reversed electron transport from glycolate to hydrogen or a hydrogen-dependent glyoxylate reduction coupled to ATP synthesis by electron transport phosphorylation [34,35]. Due to the oxygenase activity of the D-ribulose-1,5-bisphosphate carboxylase at low CO2 and high O2 concentrations, the phosphoglycolate formed in these organisms is subsequently dephosphorylated to glycolate . It is reported that no other organic or inorganic substrates are used , even though a total of 78 carbohydrate transport and metabolism genes are found the genome of this organism (COGS table). Neither sulfate, sulfite, thiosulfate, elemental sulfur, nor nitrate are reduced . Classification and general features of S. glycolicus FlGlyRT according to the MIGS recommendations  and the NamesforLife database . Strain FlGlyRT has no cytochromes and the cells contain menaquinone-7-10, with MK-9 as major fraction . Although the cells stain Gram-negative, the ultrastructural analysis shows a Gram-positive cell wall architecture . S. glycolicus FlGlyRT, DSM 8271, was grown anaerobically in DSMZ medium 298b (FlGlyM-medium)  at 28°C. DNA was isolated from 0.5–1 g of cell paste using Jetflex Genomic DNA Purification kit (GENOMED 600100) following the standard protocol as recommended by the manufacturer, adding 10 µL proteinase K to the standard lysis solution for 50 minutes at 58°C. DNA is available through the DNA Bank Network . The genome was sequenced using a combination of Illumina and 454 sequencing platforms. All general aspects of library construction and sequencing can be found at the JGI website . Pyrosequencing reads were assembled using the Newbler assembler. The initial Newbler assembly consisting of 38 contigs in two scaffolds was converted into a phrap  assembly by making fake reads from the consensus, to collect the read pairs in the 454 paired end library. Illumina sequencing data (602.6 Mb) was assembled with Velvet  and the consensus sequences were shredded into 1.5 kb overlapped fake reads and assembled together with the 454 data. 454 draft assembly was based on 163.5 Mb 454 draft data and all of the 454 paired end data. Newbler parameters are -consed -a 50 -l 350 -g -m -ml 20. The Phred/Phrap/Consed software package  was used for sequence assembly and quality assessment in the subsequent finishing process. After the shotgun stage, reads were assembled with parallel phrap (High Performance Software, LLC). Possible mis-assemblies were corrected with gapResolution , Dupfinisher, or sequencing cloned bridging PCR fragments with subcloning or transposon bombing (Epicentre Biotechnologies, Madison, WI) . Gaps between contigs were closed by editing in Consed, by PCR and by Bubble PCR primer walks (J.-F. Chang, unpublished). A total of 331 additional reactions were necessary to close gaps and to raise the quality of the finished sequence. Illumina reads were also used to correct potential base errors and increase consensus quality using a software Polisher developed at JGI . The error rate of the completed genome sequence is less than 1 in 100,000. Together, the combination of the Illumina and 454 sequencing platforms provided 215.0 × coverage of the genome. The final assembly contained 327,738 pyrosequence and 15,336,223 Illumina reads. The genome consists of a 3,406,739bp long chromosome with a GC content of 46.4% (Table 3 and Figure 3). Of the 3,439 genes predicted, 3,370 were protein-coding genes, and 69 RNAs; 119 pseudogenes were also identified. The majority of the protein-coding genes (68.7%) were assigned a putative function while the remaining ones were annotated as hypothetical proteins. The distribution of genes into COGs functional categories is presented in Table 4. Graphical circular map of chromosome. From outside to the center: Genes on forward strand (color by COG categories), Genes on reverse strand (color by COG categories), RNA genes (tRNAs green, rRNAs red, other RNAs black), GC content, GC skew. We would like to gratefully acknowledge the help of Maren Schröder (DSMZ) for growing S. glycolicus cultures. This work was performed under the auspices of the US Department of Energy Office of Science, Biological and Environmental Research Program, and by the University of California, Lawrence Berkeley National Laboratory under contract No. DE-AC02-05CH11231, Lawrence Livermore National Laboratory under Contract No. DE-AC52-07NA27344, and Los Alamos National Laboratory under contract No. DE-AC02-06NA25396, UT-Battelle and Oak Ridge National Laboratory under contract DE-AC05-00OR22725, as well as German Research Foundation (DFG) INST 599/1-2.